Walks in the neighborhood are the inspiration for this garden. The owners had a few key ideas in mind: low water, low maintenance, and a simple yet beautiful composition of plant materials. The house had a front lawn since it was built in 1939. It was time to remove the lawn, and update and refresh the garden. All of the trees, the remnants of a lawn, and plants were removed. What remained was a world of possibilities. Silversheen pittosporum line the edge of the garden creating a soft natural fence. 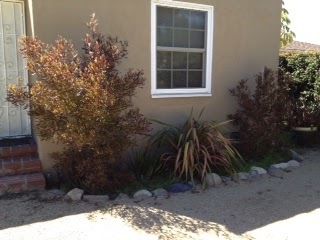 Concrete pavers lead you from the opening of the natural fence to the front entrance. Either side of the pavers, where grass once laid, now has decomposed granite. 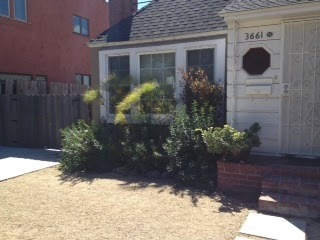 There are two planting beds under the windows that flank the front door. The planting beds are defined by rocks that were previously in the garden and repurposed. Some of the plants include: fire sticks, orange Leonotis, and Dodonaea purpurea. 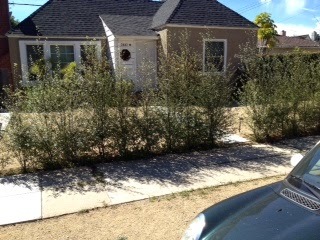 The garden was designed by the homeowner in consulation with Eddie Berumen, of Berumen Tree Service. Eddie and his fantastic team prepared and installed the garden and sprinkler system. Maintenance entails pulling weeds, trimming the plants occasionally, and watering in general once a week.